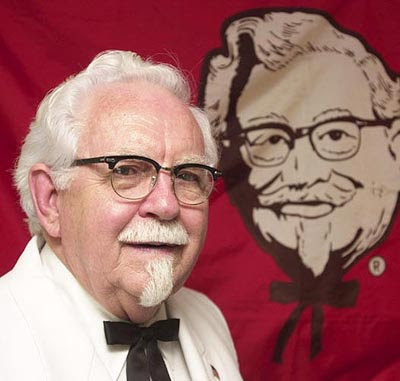 In an LA Times interview last week, Mike Myers told Amy Kaufman that he’s obsessed with Kentucky Fried Chicken founder, Colonel Sanders, and that he has painted about 15 images of him. “There’s no chicken in the paintings,” he said. “It’s just not a subject that usually has serious portraiture applied to it. Now, he’s just a two-dimensional person, and it just tickled me to paint him.” Apparently Kaufman asked to run an image with the article, but his publicist said he would prefer to keep them private. Or, um, perhaps he was just pulling Kaufman’s leg. Or was that her wish-bone?